Christiane Hunter of Tyrone in action in the All-Ireland intermediate quarter-final. Photo: Brendan Moran / SPORTSFILE. Tyrone booked their place in the semi-finals of the TG4 All-Ireland intermediate Championship with a controlled four point victory over Wexford at the Gaelic Grounds in sunny Drogheda. A Chloe McCaffrey goal just before half time pushed the game beyond Wexford and gave Gerry Moane’s side the impetus to power on after the break. The decisive goal itself was laid on by a sublime footpass from centre forward Maria Canavan. Wexford replacement Amy Wilson provided a gloss to the scoreline with a goal at the second time of asking after her penalty was saved with the very last kick of the game. The Red Hand ladies shot into an early lead with Niamh Hughes scorching through the Wexford defence to open the scoring. Emma Jane Gervin and Gemma Begley quickly opened their accounts soon after. Gervin added another score before Tyrone were shell-shocked with a poachers goal completely against the run of play from Wexford midfielder Bernie Breen. The danger seemed to be averted in the Tyrone goalmouth before quick thinking Breen stuck a leg on a bouncing ball to divert past the helpless Shannon Lynch. Begley on the edge of the square levelled, before Chloe Foxe brace opened up an unlikely two point lead for the Leinster ladies. Begley however was a constant threat and would not be denied, she added another brace along with Gervin to give Tyrone the lead before the McCaffrey goal made it 1-8 to 1-4 at the interval. Last year’s All-Ireland finalists lifted it after the break leading by 10 points at one stage. Lycrecia Quinn scored with her first touch after being introduced at half time. The impressive McCaffrey notched two points, Neamh Woods and Niamh O’Neill got on the scoresheet too. Wexford under Anthony Masterson showed heart and tested Lynch time and time again in the Tyrone goal. Fiona Rochford kept asking questions with two points before the late penalty. The Red Hand ladies could afford to have Emma Mulgrew yellow carded at the death as they eased into the final four. Scorers: Tyrone: G Begley 0-5, C McCaffrey 1-2 , EJ Gervin 0-4, L Quinn, N O’Neill, N Hughes and N Woods 0-1 each. Wexford: B Breen 1-1, C Foxe 0-3, A Wilson 1-0, F Rochford 0-2 (1f), C Murray (1f) and N Moore 0-1 each. 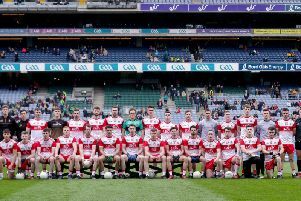 Tyrone: S Lynch; N McGirr, J Barrett, C Hunter; S McCarroll, E Mulgrew, E Brennan; N Woods, EJ Gervin; N Hughes, M Canavan, A O’Kane; N O’Neill, G Begley, C McCaffrey. Subs: C Conway for J Barrett (22), L Quinn for A O’Kane (HT), G Rafferty for N O’Neill(43), M Mallon for M Canavan (54), A Tuohey for N Hughes (57). Wexford: MR Kelly; S Murphy, M Byrne, N Mernagh;C Donnelly, F Rochford, N Moore; R Murphy, B Breen; N Butler, K Kearney, E O’Brien; C Foxe, A Murphy, C Murray. Subs: G Hearne for S Murphy (41), A Sheil for N Butler (48), R Bennett for C Murray (50), M Doyle for C Foxe (50), A Wilson for K Kearney (57).